Bird Rider’s electric scooters appeared on the streets of Columbus in early July and immediately began drawing attention. Bird currently operates in Downtown Columbus, the Arena District, and the Short North. The electronic scooters have also been introduced in Cincinnati. Bird dropped scooters in Cleveland in early August, but they were later pulled from the streets after the city announced it was banning the scooters until legislation could be enacted to regulate them. Bird Rider’s customers simply download a mobile app, scan their driver’s license, unlock the scooter, and then pay to ride them at a rate of 15 cents per minute. The next user then opens the Bird app to locate dropped scooters throughout the city. Since the scooters are motorized, and can reach speeds up to 15 mph, they are meant to be ridden in the street or along bike paths and are not permitted after sunset. Bird staff collect the scooters at night to charge them up for the following day. Their riders claim they are cheaper than typical rideshare transportation such as Uber or Lyft and offer a fun alternative to walking. 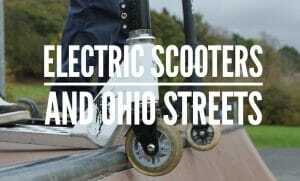 Electric scooters do not fall under any of Ohio’s traditional vehicle classifications. Many city officials claim they should fall under the “motorized scooter” category along with vehicles like Vespas, meaning that under state law riders would be required to have a license and title. However, a spokeswoman for the Ohio Bureau of Motor Vehicles claims the scooters do not fall under any applicable category. Columbus City Attorney Zach Klein has instructed the Division of Police to permit scooters on both sidewalk and roadways until the city determines how to regulate them. However, the city of Bexley recently took matters into their own hands, deeming the scooters illegal and removing all operating scooters from the streets. Bexley police claim they were in violation of the city’s ordinance involving transient dealers when they found several scooters parked on sidewalks. They are holding the scooters until Bird employees come to collect them. Bird Rides, currently valued at around $2 billion dollars, operates in roughly 22 cities, with that number changing frequently. They have been incredibly successful in cities like San Francisco and Washington D.C., while several other cities have removed them entirely due to violations of city ordinances. Minneapolis-St. Paul recently told Bird to remove all 100 scooters operating in the city due to a failure by Bird to obtain legal permits. Indianapolis ordered a cease-and-desist on Bird while city officials work on the rules and regulations surrounding them. Bird recently launched in Cincinnati with no advanced warning, adhering to what many call their “drop first, permit later” business plan. Cincinnati residents claim the scooters were placed overnight. Most cities do not have ordinances which address scooters such as these, leaving city officials and law enforcement scrambling to figure out how to regulate them. Bird officials claim they are open to working with cities to make for better transportation. Lime, a rival scooter business, recently launched a fleet of similar scooters in Columbus, operating out of Downtown, Clintonville, Linden, and the South Side. In late August, Lime announced it would be introducing 125 dock-less bicycles and electronic scooters onto The Ohio State campus. Lime scooters will offer an alternative form of transportation for the many students without cars. College officials hope they provide an affordable means of travel while simultaneously reducing Ohio State’s carbon footprint. ← The 2018 Post Election Conference has a New Location!